Machine wash a leather jacket? Oh yes you can. During the annual Labor Day International Street Fair in Orange, I checked out a few of the shops that line the streets of the charming downtown — mostly to get out of the heat. 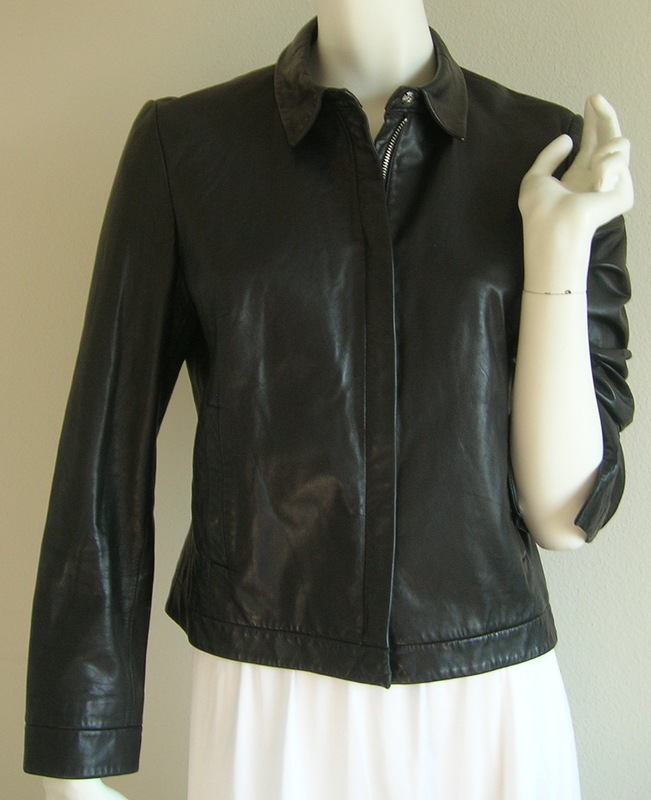 Turns out it was my lucky day — in the Antique Depot on Glassell Street, I found a brand new leather jacket for $24. But after just one night at home, the jacket had filled my closet with an overpoweringly sweet, musty stench — no bargain was good enough to justify that smell. 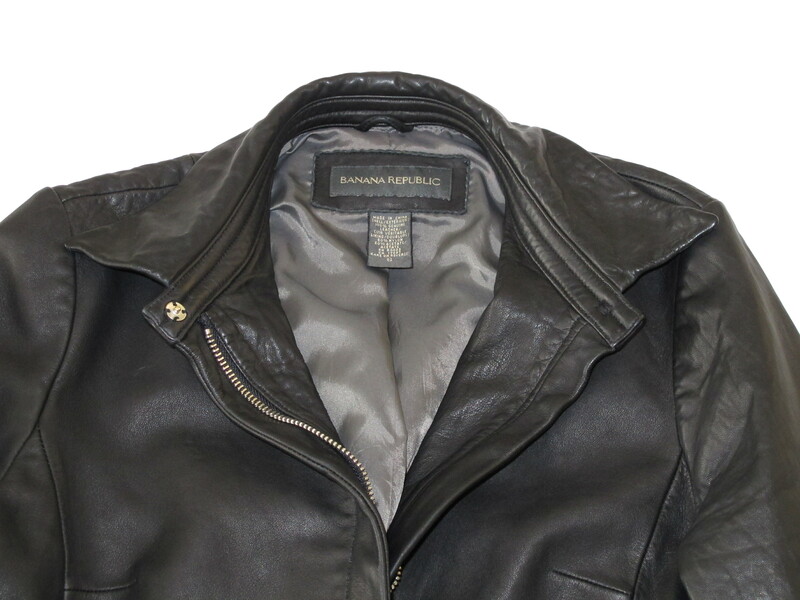 I’d read that Vogue editor Meredith Melling Burke machine washes and dries all her leather jackets, so I dug around and found more info on machine washing leather here and here. Armed with my research, I decided to take the $24 risk. Spoiler alert: glad I did. Wash: I added about two tablespoons of laundry detergent to the washing machine, then filled with cold water on the smallest load setting. I threw in a couple pairs of black workout pants and a few dark socks to help cushion the jacket and absorb some of the water during the spin cycle (not sure it’s necessary, but it didn’t hurt), then zipped the jacket, turned it inside out and added it to the load. Finally, I set my machine to run for the shortest wash time (six minutes) on the “delicate” cycle. Before drying: I inspected the jacket after the wash cycle to make sure it hadn’t sustained any damage. It looked perfect. Since the sleeves already ran a tad short on me, I stretched them gently and they ‘grew’ about an inch or so. Note: From what I’ve read, machine washing and drying works best for full-grain leathers. 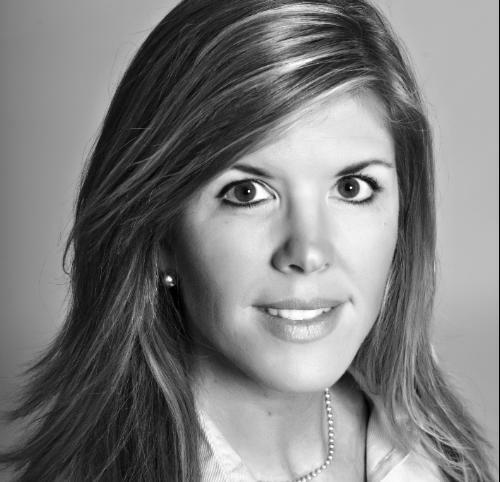 Not sure I’d put anything with a coated or shiny finish in the dryer (it might crack), though Meredith M-B says even her jacket from Target did just fine. Dry: I added everything to the dryer and tossed in three dryer sheets. (I’d seen several recommendations to add liquid fabric softener or even hair conditioner to the wash load to protect the leather, but since I was a bit worried about staining, I used Bounce sheets instead.) I selected the “medium” heat setting and turned on the dryer . After 10 minutes I checked the jacket — still wet, but the lining was dry enough for me to turn inside out and try on. It fit pretty much exactly as it had when I bought it. I stretched the sleeves again, turned it inside-out and put it back in the dryer. In total, I dried it for about 40 minutes, trying it on and stretching the sleeves every 10 minutes. When I removed it from the dryer it was still slightly damp, but the body and shoulders had shrunk (about an inch in both width and length) and since I didn’t want it to get any smaller, I laid it flat to finish air drying. (I was afraid I’d end up with weird pointy shoulders if I hung it to dry). It worked! Machine washing got rid of the smell and gave the jacket a more fitted, lived-in look. It also took some of the shine off the leather, as hoped, but it still looks and feels supple. ← Ode to Sinéad. Sort of. That sounds and looks great! I am one for wearing my leather with just a vest on and I often worry about marks etc…. I am going to try this as I have bought a leather off ebay to which I would like it to have the ‘ worn in ‘ look. As I only won it for 99p I am giving it a go ! Good luck, Susan — let me know how it turns out! I love that you did this! Very brave. Sharp looking jacket–can’t wait to see it in person! Elvis would be proud. You totally rock this smooth, slick and odor-free jacket. Can’t wait to try this trick too. Thanks J! As I mentioned to you, I have a suede jacket that I need to do this with. Just wondering… when the jacket shrinks up a size, what happens to the lining? It stays the same, but it works out okay? Hmmm — the suede jacket I washed doesn’t have a lining — just the smooth leather side of the suede — so I’m not sure. 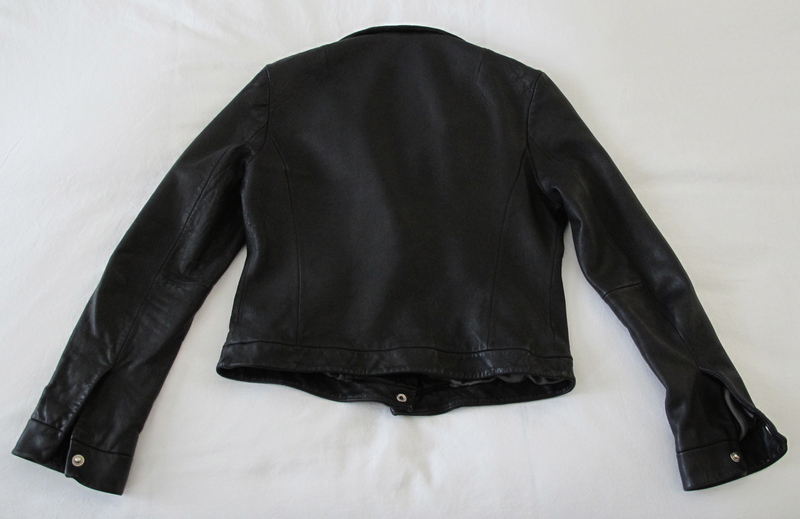 The leather jacket I washed (three times!) was lined, but since the lining is stitched about an inch in from all the seams, there hasn’t been any problem with it showing. (I also think the lining may have shrunk a bit with the jacket since I dried it in the dryer the first time.) Hope this helps! I purchased a Live A Little (Nordstrom brand) turquoise lined suede jacket at a local thrift store. The label states it is 100% leather, yet it says to hand wash inside out using mild detergent. It specifically states not to wring and to line dry. After I purchased this I noted two areas where sticker residue has remained from affixing price tags…dummies! I’ve been everywhere for advice on how to get them out and no one wants to give any advice because it’s “washable suede.” I keep getting comments from various dry cleaners that dry cleaning would get the residue out, but they won’t touch it because the label says to hand wash. I’m going to try washing as instructed, but I wouldn’t chance putting it in the dryer because of the lining and possible shrinkage. Good luck and if anyone reading this knows how to get sticker residue out of washable suede please let me know. If all else fails I’ll have to do some type of applique or studded design to hide it. hello! I wonder if it will shrink a lot? Because a jacket that i have is lambskin, and it fits me just fine! I wonder if i could still wear it after wash and dry it.. thanks a lot! Hi Alex — it probably will shrink if you wash it and then dry it in the dryer. I *wanted* mine to shrink so I wasn’t worried. If you just need to clean your jacket because it’s dirty, I’d suggest professional leather cleaning if you’re really worried. Or you could try washing it in cold water, inside out, on the shortest delicate cycle. Then lay it flat to dry. Try it on a few times throughout the drying process to *gently* stretch it back into shape if needed. Good luck! It’s fine I wash my Harley Davidson Jackets cowhide & lamb in the washer all the time just pull them out of normal medium heat dry periodically to stretch back to size while still damp – I was worried 😩 with the 1st one my puppy got carsick… blech- but 😳 👍🏼 & looking a little more loved in. Wow that was strange. I just wrote an really long comment but after I clicked submit my comment didn’t appear. Grrrr… well I’m not writing all that over again. Sorry to hear that, Leona — I’ll look into it. Hope you love your “new” jacket! Glad it was a success, Natasha! I washed and dried an old, cheap suede jacket (after writing this post) and it came out fine, as well. Great I’ll try and see what’s happene? so u can wash it? hmm nice 2 know. when you washed your suede jacket, did you use fabric softener like Downy? Not a liquid softener, Alma — just the dryer sheets as I describe in the post. I bought a new leather blazer at a really good price. Sadly, I never wore it because it was too shiny and stiff. washed the jacket on delicate in cold water with detergent for delicates. I then dried the jacket on low heat for 45 minutes then laid it out flat to finish drying. Other than the edges of the blazer not being as crisp, the jacket came out great. It was soft and felt lived in. I ironed the edges to get the crisp sleeve and bottom edges. Thanks for the post. So happy it worked for you, Terri! Never thought about ironing leather — did you protect it with a towel or something? I never use general detergent in a machine to wash my leather jacket. I always use Leather-Clean as a detergent in a machine at home. Really a good article. I appreciate it. I just tried your instructions on a 17 year old favorite leather I bought up in Alaska from Settlers Bay Golf Course. Odor is gone and it is clean to perfection.Thank You. Hello and thank you for the info. It changes a wild and crazy notion of mine into something I am certainly much more comfortable with trying! My coat is suede – the type of thin suede that can only come from a top-quality leather, I presume… Wish me luck! Well, I washed the coat…. To Wit: the coat was very thin suede outside, with cotton lining at chest and back – polyester in sleeves. I got the coat about twenty years ago and rarely wore it – just looked at it every once in a while wondering if I should have it tailor fitted where it was too big…. I always wanted a leather coat – and this coat is as close as I could get to having one. I turned the coat inside out and washed with cold water and delicate cycle. I threw in some other things (my brand new white undies are now leather colored, so need re-washing!) for agitation. I watched it closely throughout the processes, every once in a while…. Only at the very end did I turn it right-side out so that the leather would dry in dryer, on regular-clothes cycle, so that it would shrink just a little. It has been done! Joy of joys – it has been done. Couldn’t have done it without this blog, so thank you very much!! Nice Blog, thanks for sharing this kind of information. Does this actually work cause my dad has a Ohio state leather jacket and I have a massini leather jacket and will it work with liquid detergent? i have an older leather biker jacket, the kind with studs and some painted spots, and even an autograph from Glenn Danzig (did I just really age myself or what!?) and I really need to shrink it, since it’s a men’s jacket. But I am totally afraid of losing the paint (and only a little Afraid of losing the signature…no real tie to it). I believe the paint is acrylic or possibly an oil based paint pen. Do you think it will wash off if I just let it SOAK in hot water without agitation? Hi! I just tried doing this to my jacket (soft leathered and nearly new) and at first all was good. It was in the dryer and looking supple still. But the dryer overheated and I was only able to get 5 minute blocks out of it. So its a couple of days later and the jacket is still not dry. Parts are becoming uneven and other parts are rough and dry. Help!! When I was a teen, I had a favorite tan suede leather jacket that got really grungy. Without my knowing, my loving non-English speaking grandmother thought it was a good idea throw it in the wash with the rest of the laundry. There it was on top of all the clean laundry and it looked brand new. I tried putting it on and couldn’t because it shrunk down to toddler size. Since then I have done a cold water wash with a couple tablespoons of liquid Tide on a leather jacket but too afraid to put in the dryer. It takes a while but it dries fine on a sturdy hanger in the laundry room and no shrinkage. I am surprised! I own a leather laundry service back in my home-town in India! We NEVER recommend washing a leather jacket that too with detergent! When washed with water, it not only shrinks, but can also get damaged and sustain bad water stains! If the only requirements was to remove the stench, then there are several deodorizing techniques available! One is simply leaving the jacket to dry under the sun for one whole day! Another is the application of deodorising creams! You were lucky that your jacket came out fine! It is not always the case! :) Cheers! My guy has a Minnesota Viking jacket that has many colors and Viking designs om it so I was unsure about putting it in the washer. It was really dirty so I sloshed soapy water all over the outside and scrubbing where it was dirtiest, even the knit cuffs and collar.Then I wiped it down with clean water and dried it with a towel. It looks and smells great now. Thanks! I just bought a really nice black men’s leather jacket from a thrift store. The jacket fit perfectly but it just had this funky smell to it. I aired it out and tried vinegar but the lining just continued to smell, so i decided to give the washer a try. I put it in cold water, delicate cycle with some liquid detergent. I turned the jacket inside out and twenty minutes later i took the jacket out of the washer and there was no damage to the leather or liner. I decided not to put it in the dryer as i was worried it would shrink it. I put the jacket on my dining room table and dried it with a towel. Then I hung it on my porch in the shade where it was sixty degrees. A few hours later i tried it on…..it was still a little damp but it didn’t shrink. The sleeves of the jacket and collar are still straight and no crinkling, and best of all the funky smell is gone. Thanks!! I read your directions and decided to try washing two lined leather jackets, one at a time. I turned the jackets inside out and washed on the shortest cycle with tap cold water. I dried it on the lowest setting for about 40 minutes and removed while damp. I hung them up after turning them right side out to finish drying. Genius result! Soft and fresh appearance. I am thrilled! I bought a leather blazer at Goodwill, and just couldn’t bring myself to spend twice as much to dry clean it as I paid for it. The leather appears clean but I wanted to wash the liner of the coat more than anything. I washed a delicate sweater inside a pillowcase. Only because I could not find my zippered nylon case. I put a few of my delicate sweater in the pillowcase and tied the top and put it in the washing machine. It didn’t stretch my sweaters or change the shape. So I should do this to my leather jacket and see what happens. Tried this with a thrift shop find and it worked really well! I actually was surprised because it had a nasty smell and I had been contemplatig washing it for months. I have been reading that some people comoplain thier jackets have become stiff and brittle, when I was in Argentina a sales person recommended a method for keeping leather supple and soft, spray pledge or any other wood spray cleaner on it! I was scheptical but she did it to a leather purse I just had purchased and it still looks great, that was a couple of years ago. After you apply the spray polish the area with a dry clean cloth. My late brother gave me his pilots jacket when I turned 40, problem is he smoked a lot of wacky backy and so there are probably traces of the stuff on the jacket. Nor the jacket is washed and I can wear it while traveling without the risk of being in trouble at an airport. Thank You. I have to leave my 2 cents worth. I bought a used Schott Motocycle Jacket. It smelled really musty and was all scuffed up. I had planned to just put patches on it and leave it beat up .. so didn’t pay what they were worth .. but also wasn’t in the top quality. We followed (my wife did) the directions and put it in the washing machine .. when it came out .. I was blown away. It looked new .. it looked as good as the one my son had just purchased for over $700 .. I had purchased a leather softener that rated really high .. but not sure I will need to put it on yet .. I stretched it a bit while it was wet .. it seemed to give me a little room .. which I loved .. and then laid it to dry .. I only put it in for 10 minutes in the dryer .. thank you so much .. worked great. So happy to hear it worked out for you, Dan — thanks for your two cents! Do you know if I can wash a leather jacket that has a fur collar? I don’t Deb, but unless it’s synthetic (faux) fur, I wouldn’t try it. I once tried machine washing a fur scarf on the delicate cycle and it completely fell apart in the washing machine. Great idea!! I recently bought a nice leather on eBay that reaks of cigarette smoke. I tried airing it out for weeks without any luck. I’m tossing that sucker in the wash tonight!! I have an old leather jacket that becomes stiff and long in the sleeves, will washing help it shrink? After washing did your jacket felt softer? Hi Joan — yes, my jacket was softer after both washing and drying. I’m not an expert, but I didn’t want the sleeves to shrink so I purposely stretched them. Am guessing if you did nothing, the whole jacket would likely shrink. Just washed one I bought at yard sale, didn’t realize it had mold on it. Now it doesn’t and is softer too Left in medium dryer for about 20 min.. letting hang to finish drying. thanks for posting this. Found a motorcycle leather jacket in a thrift shop with a Cougar medallon so looked it up a it seems it price at $200… The tag was $20. but the zipper in insert cold weather lining was missing, at the checkout I told the shopkeeper if can do better on the price because of the missing lining. He said okay $15. Great but I like to clean it to start fresh. I’m washing now and will get back to post the results when done. PS. I don’t ride in cold weather so no need for the weather insert lining. Brilliant advice. I just washed the jacket I bought eBay, which disappointingly smell of incense! It is a designer jacket and I just couldn’t face sending it back or giving it to the charity shop so I stuck it in the washing machine. It has come out like new – a complete revelation. Thank you! Thanks very much for the awesome suggestion, I probably would not have tried it without your success story! I too like leather jackets, mostly old aviator style, since I’ve had my private pilot license for almost 30 years. Problem with wanting an old style, vintage leather jacket is of course, the cost. Months ago, I picked up a older L.L. Bean A-2 style goatskin jacket from Craigslist with the older style one piece back, made in USA and sized to fit, not just xl, but 46 long. The jacket came as advertised, great shape, but, I forgot to ask if the seller was a smoker. The stench was horrible. Couldn’t even hang it up to air out. It stunk up the two car garage! !, nasty…So, I had seen your information and thought I had to try it, only paid $35 for the jacket and could not resell it to anyone in the condition smell it was in. The only change I made was to use hair shampoo. The results were outstanding! The leather was a little stiffer but still supple, in fact the jacket looked, felt and smelled great! !…So, I ordered some original wool wrist and belly bands, had them professionally installed and now have a great vintage leather flight jacket for cheap. Thanks to you!! I tried this method of cleaning my great find. Tan leather jacket lined beautiful cut $10.00 from an op shop. Rang up for quote to have dry cleaned as label said ( proffesional clean only.) Dry cleanner quoted from $150.00. After the shock i googled your fantastic advice. I bought some Lux soap . Set washing machine to delicate cycle. Added jacket inside out into a pillow case. And pressed start. I do not have an agitator on my machine so was a bit relaxed. And it has just finished its cycle and it so PLEASED it didnt shrink or. Fall apart. Can not wait for it to dry completely. I did put it in dryer for approx 6 minutes inside out. Thank you so much. Will definitely pass this great news on. .
i know this is a bit old, but just wanted to say thanks!! i got a nice brown leather motorcycle-type jacket at a community church tag sale today for $5, but smells a little old and i don’t like wearing things without washing them first anyway, so i tried a google search. very excited that i’ll be able to clean my new jacket! can’t wait for fall and cooler weather so i can wear it! We recently moved so I had to pack up my coats. While they were in a storeage box some of my coats got wet. Of course one was my lined leather coat. We finaly found the box it was in but it is stiff, water marked and a lite coat of mold on the black leather. Do you think the machine wash will work for this? ive had my leather jacket for over 20 years i put it into the washing machine every time first zipping it up and then turning it inside out. The only problem is the drying which takes about 5 days ive had no problems. I have a brown jacket that I bought for £15 from a charity shop 2 years ago. I’ve worn it a lot but just latley it’s started to smell of smoke. I thought it was worth giving it a go. The professional cleaning services charge over £50 to clean here in the UK. I washed it on a cold wash and stopped the machine after just 10 minutes. Well it seems to have survived the wash and it is currently being tumble dried (on a low setting). The smell seems to have gone too. I am looking forward to wearing it again. Thank you for your post. I have a beautiful distressed olive green leather thats over 10 years old and needs much cleaning. I am definitely going to try this nifty idea! whoo hoo! This is great! I’m making a cosplay vest for my grandson, but didn’t want to put big bucks into it (he’s got a lot of growing to do!). So I found a leather jacket at a second-hand shop, $2.98, but wanted to wash it before cutting it up and re-purposing the leather for him. Voila!!! This works! It’s hanging up for the rest of the drying process, creation begins tomorrow! Thank you so much. 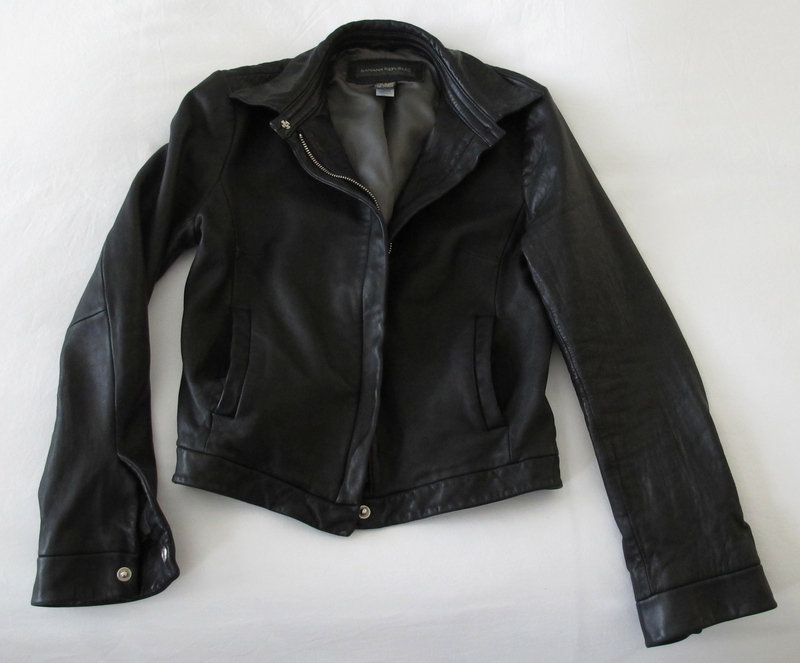 Hi, iv bought a second hand leather jacket too but I am frightened of catching scabies ? Can you please advise how to sterilize the jacket from this as low tempreture will not kill this. Regards Karen. Found this post and washed my stone/ taupe coloured leather jacket. It turned out fab. Discolouration and smells gone. No strinkage or water stains and feels soft. Thanks for letting us know, Amy. Happy it worked for you! I’ve got one for you to that will curl your hair… Two weeks ago I order a new Reddish Brown goatskin leather flight jacket from a maker in Pakistan. It has a auburn colored mouton fur collar. It came with such a horrible odor that it stinks up the who house. The wife tells me the jacket smell like animal urine., and I believe her. I’ve tried baking soda and white vinegar and with no results. The company had refunded my money, so I have a free jacket. So, I’m going to do the washing machine bit, and some drying. I’m not so worried about the leather, it’s the mouton fur that is the concern. What have I got to lose if it don’t work. This is a follow-up on the reddish brown leather flight jacket I ordered from Pakistan. Well!, I made the decision today. I wash the jacket in the washing machine. I loaded the machine full with cold water and some liquid laundry soap, also added a cup of white vinegar. Added a couple towels and couple sweat shirts to the wash. Put the machine on the delicate cycle for twenty minutes. When the rinse cycle became, I added some fabric softer and let that come to the finish part. I removed the jacket and all the other items and put them in the dryer on the delicate run for about ten minutes. Removed the jacket which was still wet. Taken a dry towel and patted down the jacket to remove some of the water that was still in the leather. So, I hung it on a hanger and put it outside for about four hours in some sunlight. I now have it laying flat on a table with an old bed comfort under it to let dry. BTW: The jacket doesn’t appear to have lost any color or shrinkage. And there is no more of the horrible smell. Thanks so much for taking the time to share your experience, Burt! Happy it worked for you — guessing it will help others too. Edit by Design is about simplifying and improving life. And some things that may be entirely unrelated.